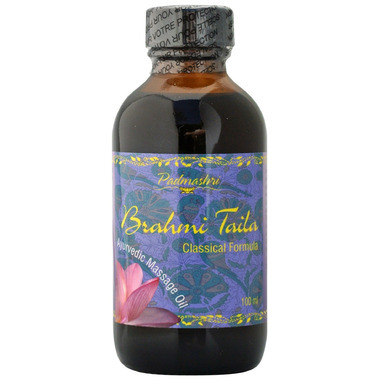 A nourishing oil for the brain, head and nervous system, Padmashri Classic Ayurvedic Massage Oil Brahmi has a refreshing quality and a special effectiveness on excessive Pitta. Applied daily to the head, it prevents premature grey hair and hair loss, reinforces all sense organs, and alleviating disturbed nerves. This important formula contains Ayurvedic herbs traditionally used as “Medhya Rasayanas” or “Mental rejuvenatives”, including the herb Brahmi (Bacopa monniera), whose name means ‘consort of the divine’. Can be used safely in both the children and elderly. How to Use: Apply topically to the head and hair, allow to sit for 10-20 minutes before washing out. May also be used as nose drops, 1-2 drops in each nostril. Key Herbs: Bacopa, Amalaki, False daisy, licorice and milk and cold pressed sesame oil. For external application only. May contain trace amount of dairy.